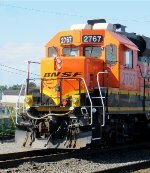 Description: BNSF 2767 leads a local delivering one car. Title: BNSF 2767 hauls a short grain train over W 11th St near the Amtrak station at Vancouver. Description: Not a lot happening in Butte this Sunday morning. Cab 12389 in the background. Description: BNSF 2767 sunning herself way down into the depths of the service/inspection area - and dang it, dont you just hate it when they hide the new units as far as possible from the prying eyes of the adoring public? Description: BNSF 2767 - BNSF 2832 yard pair getting their turn in the service lane under hazy, early evening skies - t-minus two weeks and counting to the rains. Description: BNSF 7892 in a power-in-waiting lane with BNSF 2767 in the background getting the once over-and-top-off in the service lane. Description: BNSF 5473 northern most of the four in the power holding pen. Yard girl BNSF 2767 hides under the inspection pit roof between the rains. 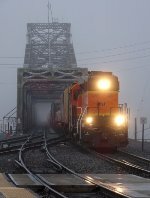 Description: BNSF 2767 mid-yard by the Fourth Plain over-pass in ladder sort-n-shuffle duty. Description: BNSF 2767 and this is all I could find for a half-hour or more of looking. What a difference a week makes in luck. At least with all this heavy rain, even RP decides if the nutcase wants to get soaked at this time of night, let him - and I can shoot the whole three local units available in my own sweet time... except for the cold... and the rain... and the wind. Sometimes you have to respect your adversarys smart tactical moves - like staying out of the weather. (Terrible we have to have an adversarial relationship in the first place - Im willing to live-and-let-live. Just get a bit antsy about hearing from the better-half, "You know, your rap sheet is a mile long, even if it _is_ all legal observing... theyre still calling your license in every time." So how about it, Mr Buffett? Can I finally have a press-pass? Make me an honest man? Just an offer. Description: BNSF 2767 GP39 paused in the waiting corral under dreary, rainy skies... and between the tilted light poles, odd angles, annoying keep out hurricane fence... and the wind with rain, it seems I cant get a level horizon no matter what. Description: BNSF 2767 sunning her nose in the late afternoon/early evening sun on the bridge protection spur. Description: BNSF 2721 (BNSF 2767 immediately off her port-bow) hanging out in the large congregation of Geeps back in the power corral this particular evening.